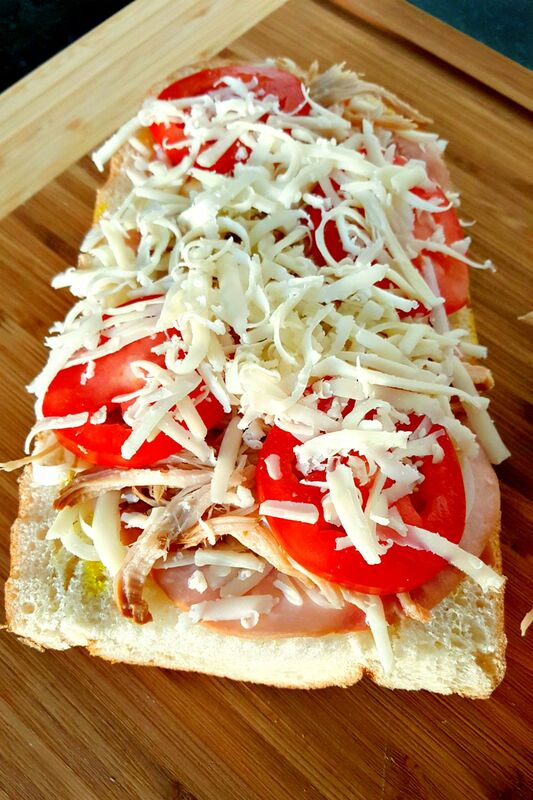 Cubano French Bread Pizza has all the delicious flavors of a Cubano sandwich but in a quick and easy French bread pizza form. In April, I made this pork. For some reason, I was just dying to make some Cuban pork in my slow cooker. I mean, I love Cubano sandwiches. The mojo criollo alone just sounded amazing and I couldn’t wait to try it! If you haven’t made this recipe, you really should. It’s super easy and OH MY GOODNESS fantabulous! Yes. I like making up new words for my delicious recipes. Deal! Considering it was a large pork roast that we made for ourselves, we had quite a bit left over. I froze about half of it for use later. Initially, I thought about making sandwiches, but then the hubs and I had that conversation about sandwiches. So, that pretty much nixed that idea. 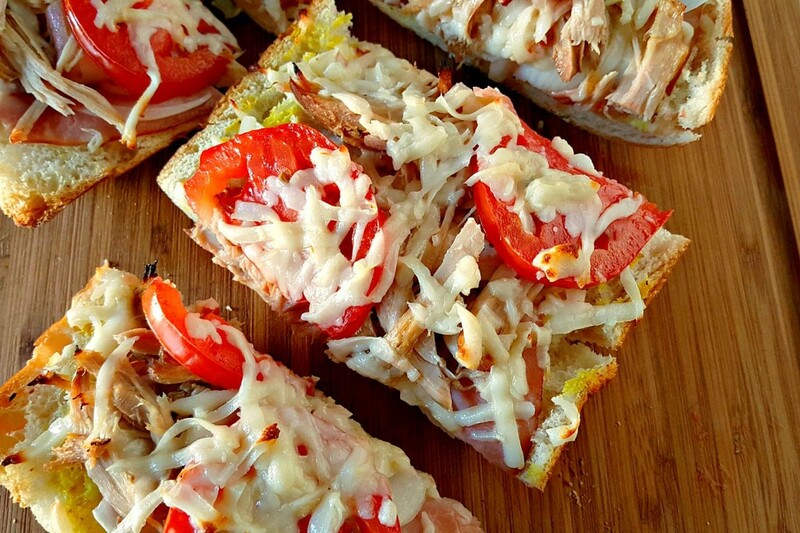 But then – now be prepared to be surprised – I was wandering around on Pinterest – I know, but I warned you – and saw a recipe for Cubano pizza. Bingo! Except, my dough making skills are lacking. How about French bread pizza? Now comes the dilemma. What’s the sauce? Considering nothing about Cubanos leads me to think a regular pizza sauce base would be good, I was trying to figure out what to use. I knew the hubs wouldn’t deal with mustard. Because, well, I know him. But I did want to incorporate mustard into the base. But how? Then it hit me! You simply take the mojo criollo and mix it with mustard! BINGO! It was a total stroke of genius. I must say. The result of these two flavors truly do capture the essence of the Cubano sandwich. All in all, it has the mustard flavor, the fruit tones, and then that lovely garlic flavor in the marinade for this pork. You’ll feel like you’re sitting in Little Havana in Miami chowing down on one of these delicious sandwiches. Now, I know I’ve said it before. There are just some dishes where I truly do surprise myself. Consequently, this is one of those dishes. Honestly. I could have eaten all four servings. It.was.that.good. I took my first bite, and just sat back in my chair relishing every bite. The complex flavors of this dish was amazing considering this was pretty simple to prepare. I just closed my eyes and pictured myself in Miami; hearing the sounds of the people and the aromas of the food. I was there, in my head of course. This dish really did take me out of my kitchen to Miami. Have you ever been transported to another place with your cooking? Combine the first eight ingredients (garlic through black pepper) in a small mixing bowl. Using a pastry brush, brush the mixture over the top of the French bread halves. Sprinkle a handful of Swiss cheese on each half. Top with the ham, more cheese, salami, onions, Cuban pork, the rest of the cheese, and the pickles. Bake at 400 for 15 to 20 minutes or until the cheese is melted and the Cuban pork begins to get crisp and brown. Remove from the oven and cut each half into six slices. I’ve been wanting to make a cubano since seeing the movie Chef and this is such a creative spin on it! Thanks for linking up to #SaucySaturdays. Thank you! And it was OH SO GOOD! It’s #onthemenu to make again soon! Thank you, Carrie! 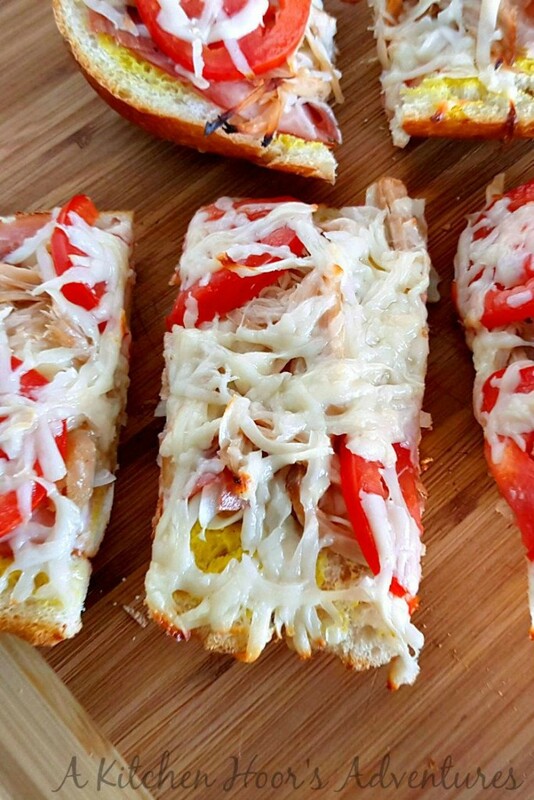 It honestly was my BEST French bread pizza EVER! I hope you like it. I make large portions of pork quite frequently and I love to freeze some for burritos and bbq pizza. But now I am going to use some to try out this Cubano Bread. Looks great! Thank you! I honestly could have eaten the whole pizza it was OH SO delicious. Thank you! It definitely could be for either lunch or dinner. OR sliced in thin strips and be an appetizer or snack. It’s versatile.